Ruth had a special love for Chabad of Chula Vista, Rabbi Mendy, Mussie and they're children. They were the last ones to visit her before her passing, to say a special prayer with her. 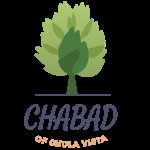 By contributing to Chabad of Chula Vista, you will enable us to start a special project in her memory. Thanks for being a part of Chabad and sharing in Ruth's and our vision, making sure every Jew in Chula Vista has a place they feel at home, feel loved and connected to our heritage!